The Student Bursary Scheme 2018 is now closed for applications. As part of our work in promoting the Public Sector Equality and Human Rights Duty, the Irish Human Rights and Equality Commission is delighted to announce the launch of the third year of our bursary scheme for prospective students of the Professional Diploma in Human Rights and Equality at the Institute of Public Administration. The Professional Diploma in Human Rights and Equality is a one-year, part-time programme that has been developed in conjunction with the Institute of Public Administration and is now enrolling for October 2018. Candidates who do not complete the diploma course or assessments will be required to provide the cost of the fees covered by the bursary. Applicants will be asked to demonstrate how they intend to use the learning from the diploma in their work. Relevant organisations are asked to nominate their candidate(s) to be considered for the bursary scheme and provide official sign off of the application. More than one staff member from each organisation can submit an application. However, in the event that the diploma is over-subscribed, priority will be given to ensuring that as many organisations as possible are represented. The closing date for applications is 5pm Friday, 22 June 2018. All eligible applications received will be assessed by a panel convened for that purpose. The assessment panel for this bursary scheme will comprise of relevant staff of the Commission and independent external expertise. To be eligible, applications must achieve a score of at least 50% of the points available on each of the specified criteria, and a minimum total score of at least 60% of the total points available. For avoidance of doubt, this does not mean that applications achieving these minimum scores will be supported. 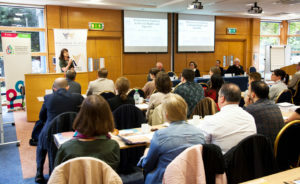 Students combine self-directed study (course material provided) with attendance at four two-day seminars (eight days in total) at the IPA campus in Dublin. It is a level 8 (Special purpose) award and is accredited by UCD. The diploma seeks to give students a better understanding of the place that human rights and equality occupy in public management and administration. Applications can be made online via the student bursary scheme application form. Civil society as defined under the Irish Human Rights and Equality Commission Act 2014 includes a reference to— (a) non-governmental organisations concerned with the promotion or protection of human rights or equality, including organisations specialising in the promotion of economic and social development, (b) trade unions and other businesses , professional and social organisations, (c) third level institutions and other experts in education and (d) religious bodies, secular bodies (within the meaning of the Civil Registration (Amendment) Act 2012) or other groups that are representative of religious thought and beliefs or philosophical beliefs.